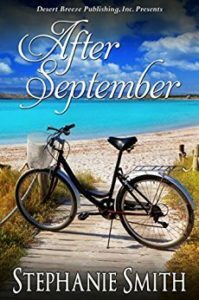 After September by Stephanie Smith is a delightful Christian feel-good romance and I loved it. The book is jam packed with godly themes and has the heart of God at its core. There is the theme of healing. There is both literal healing and a healing of hearts. “You need time to heal. I think this is the place to do that.” After twenty four years of marriage Rose found herself divorced and traded in for a younger model. Hurting, she changed her whole life and headed to a tropical island for the summer, to rethink her life. The novel shows how in her pain, Rose walked away from God. “She was still angry with God, she needed to trust everything would be all right.” She walked away from church too. “Not knowing what else God expected of her, she stopped attending church altogether.” Rose had equated being a Christian with a trouble free life. That just doesn’t happen. God does not cause our troubles but He walks alongside us in our pain.